Testing is one of the fundamental areas in software engineering which require resources that are often not readily available, contributing to an inefficient testing process. However, running large test suites of test cases often take considerable time and resources. Testing in the cloud has gained a significant amount of attention in the last few years. Instead of running or storing applications locally, cloud testing allows one to host their applications in the cloud and access it from anywhere using just a web browser. Cloud testing not only promises flexibility and scalability, but also guarantees web reliability. The cloud infrastructure makes it ideal for activities with unpredictable resource needs. BrowserStack and Sauce Labs are the two biggest vendors that provide cloud-based real mobile device labs to execute tests without requiring any upfront investment in real devices. Both allow users to perform tests in the cloud using a number of different browsers and on multiple operating system combinations. Sauce Labs is the leading web-based tool used for cross-browser compatibility checking using unique test automation features such as Appium mobile mobile automation tests, executing parallel tests, failure diagnosis through screenshots and video, executing tests on internal local servers, and so on. Sauce Labs provides the world’s largest continuous testing cloud to do cross-browser compatibility tests on multiple operating system platforms, including mobile emulators and simulators, as well as real devices. It allows users to automate tests in their favorite programming languages using test frameworks such as TestNG, JUnit, and many more. You need to access the website from your web browser, log in and obtain the Sauce username and Access Key and make use of the credentials to drive tests over the Sauce Labs cloud. It creates a new instance of the virtual machine while launching the tests. – BrowserStack is an automated cloud-testing platform to access virtual machines instantly which allows user to perform multi-browser testing of their applications on different platforms and operating system combinations. It is an enterprise-focused software company based out of Mumbai, India. Sauce Labs is the leading web-based which provides the world’s largest continuous testing cloud to do cross-browser compatibility tests on multiple operating system platforms, including mobile emulators and simulators, as well as real devices. Both are the leading web-based tools used for cross-browser compatibility checking on the cloud. – BrowserStack offers a basic plan for $12.50 per month (annually) for freelancers with 100 minutes of Live, while you can also sign up for a free trial that gives you 30 minutes of testing on Live. The Live Plan costs $39 for unlimited Live browser testing, along with unlimited screenshots and unlimited responsive testing, while it costs you $99/ month if you want automation and $199 per month if you want unlimited testing on all iOS and Android devices. Sauce Labs’s basic plan starts with $19 per month when billed annually, while if you need automation, it costs $199 per month and $399 per month if you want unlimited automated testing. BrowserStack is the clear winner in terms of pricing model. – BrowserStack makes it easy and fast to perform multi-browser testing of applications across many platforms and while it provides a similar setup like Sauce Labs for cloud-based automation using Selenium, it is relatively less stable than Sauce Labs. This is mostly because of the device compatibility issues or lack of access to devices. Sauce Labs, on the other hand, is a well-built web-based tool with no functional issues whatsoever regarding device compatibility. Everything works just fine and smoothly in Sauce Labs and it’s pretty easy and fast to use than BrowserStack in terms of stability. – While both are the leading web-based tools used for cross-browser compatibility checking on the cloud, they have their fair share of differences on performance grounds. The execution of automated tests can take several minutes to start in Sauce Labs virtual machines, which is much worse than its competitors, including BrowserStack. Also, the spin-up times of VMs is very slow compared to BrowserStack. Additionally, the screenshot capability that BrowserStack provides is truly unparalleled, and its support and documentation make it the most preferred choice for UI designers. BrowserStack is the clear winner in terms of performance. While both BrowserStack and Sauce Labs are renowned web-based tools for automated testing on the cloud that allow users to perform multi-browser testing of their applications on multiple platforms, they have their fair share of differences. For one, execution of automated tests takes several minutes to start in Sauce Labs virtual machines, which is worse than its competitors. 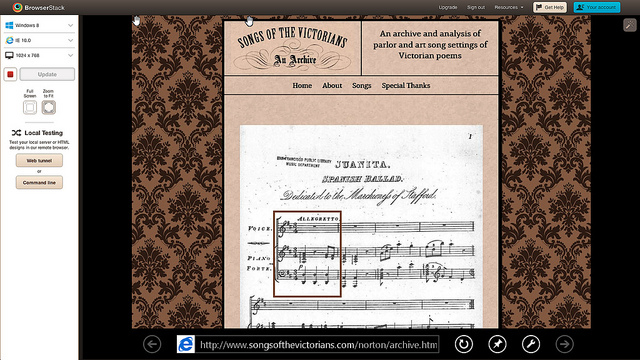 Plus the screenshot capability of BrowserStack is truly unmatched. However, Sauce Labs is a more stable application with no functional issues regarding device compatibility. So, there is no easy way to say which one is better because both are really good. Sagar Khillar. 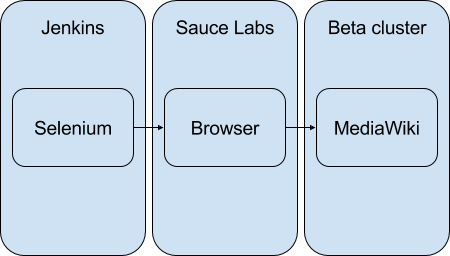 "Difference Between BrowserStack and Sauce Labs." DifferenceBetween.net. 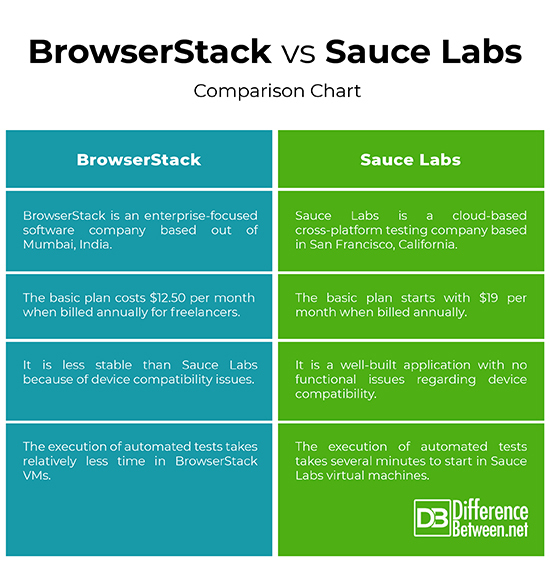 January 17, 2019 < http://www.differencebetween.net/technology/difference-between-browserstack-and-sauce-labs/ >.